Rain is a common weather type found in every GTA game since Grand Theft Auto III. As with all other weather types, it helps the game bring a realistic atmosphere for any city it takes place on, and it is a crucial aspect for gameplay. Rain usually occurs after three-five days of gameplay, depending of the climate of the city. 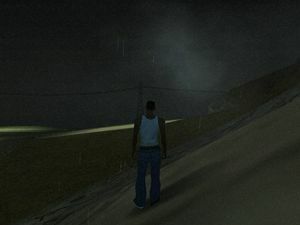 First introduced in GTA III, rain is first preceded by a cloudy climate, after which a few raindrops may start falling. Once rain starts to become stormy, streets become shinny and reflect the lights of cars and post lights, and thunders and lightnings appear. If the player is driving, it may be more difficult to maintain control of the vehicle, as the streets are more slippery. In Grand Theft Auto: Vice City, raindrops forming in the camera were added. Since Grand Theft Auto: San Andreas takes place in more than one city, rain is different in each city. In Los Santos, rain occurs every five days, while in San Fierro is more recurring. In Las Venturas, it is very rare to see rain, as it is close to the desert. Thanks to Grand Theft Auto IV's improved core, while having the same characteristics as it's predecessors, it is even more realistic. When walking, puudles of water are formed every time Niko puts his feet on the floor, and also when raindrops fall on the water. Pedestrians start running and covering under balconys or anything that covers them from the rain, and also breathe on their hands to heat themselves. Other pedestrians cover themselves with newspapers, and others with umbrellas. Niko also looks at the sky noticing it is raining and shakes his body to dry himself. Rain was noticeably rare in the original PSP release of Grand Theft Auto: Vice City Stories. Rain/storms generally occurred less often than they did in preceding games, and clouds were less commonly seen. This was rectified in the PlayStation 2 port; rain and storms occurred more regularly, and clouds were also seen more often in the sky, making the weather more similar to past games in the series. On some modestly powered computers, rain can significantly reduce the frame rate of the game, sometimes making it very low. This page was last modified on 23 April 2012, at 22:14.